iBeacons: The Next Revolution? Event at Oniracom! Mobile Santa Barbara, a meetup group created on Meetup.com, is hosting an awesome event at Oniracom this Thursday, July 24 at 6PM. The event is all about iBeacons, which may be the key to the next technology revolution! It’s a combination of hardware and software that allows a phone to know when they are near a “beacon.” This allows companies to deliver highly location and contextually-aware content. It’s most immediate applications are in retail, with Apple using it in all of its stores to know when you’re there. 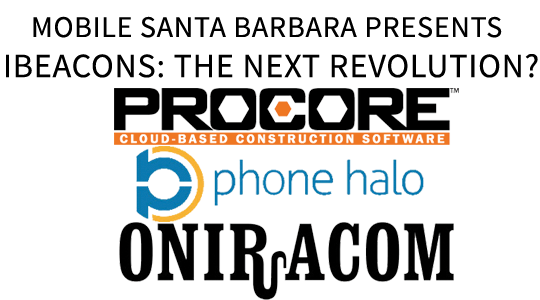 We will be joined by Christian Smith of Phone Halo, a local Santa Barbara company with over 6 years of experience in this field, Procore Technologies, a company that provides cloud-based construction management software to clients across the world, and us—Oniracom! If you’re interested in mobile technology, you should definitely check out the event. We’re located at 720 East Haley Street. The event will be from 6PM - 8PM on Thursday and food will be provided by Procore. For more info, head to the meetup event here!